A nodule is defined as abnormal tissue growth. Nodules can appear on surface (below upper layer) or deeper layer of skin or on any organ surface. In subcutaneous nodule, it appears on the subcutaneous layer of skin. Nodules commonly develop on lymph nodes and thyroid gland. Subcutaneous nodules are commonly seen in armpits, groin, region of head and neck involving vocal cords and lungs. The appearance of subcutaneous nodule can cause pain. The common symptoms are: a visible lump type appearance is seen which is hard on touch. Subcutaneous nodules may appear due to any injury or infection. The appearance of nodules also makes the patient feel severe pain. The patient have to take pain killers for the pain and sometimes it is not possible to get rid of pain with pain killers. 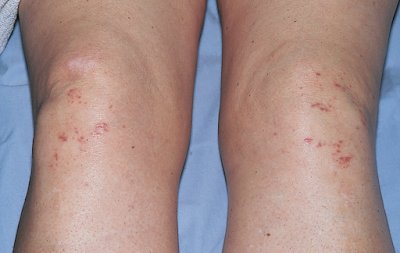 The painful subcutaneous nodules can mainly occur on the thigh area and then spread towards the lower leg area. Same in case of arm, they appear 1st on the forearm region and then spread towards back. The painful subcutaneous nodules may be caused due to inflammation or infection. The painful subcutaneous nodules may be freely moving on touch or pressing it down. Research shows that subcutaneous nodules occur in rheumatoid arthritis or rheumatoid fever. The appearance of subcutaneous nodules shows the severity of rheumatoid fever. The above statement is proved with the cases reported about rheumatoid fever, in these cases, the patient feel the pain and appearance of subcutaneous nodules. The frequency of subcutaneous nodules in rheumatoid fever may be very less but these subcutaneous nodules persist for long time and require proper treatment. The joints affected by rheumatoid arthritis shows the appearance of subcutaneous nodules at that site. That is why they are also called rheumatoid nodules. The subcutaneous nodule lupus erythematous is a skin disease in which scarring do not occur along with no production of atrophy. This condition appears on the areas of body which are exposed to sun rays. The appearance of subcutaneous nodule lupus erythematous may either papulosquamous or annular lesions. This condition may occur in patients already suffering from systemic lupus erythematous. It can be induced due to the drugs which patient is already taking. Subcutaneous nodule lupus erythematous is treated with various effective sunscreens, corticosteroids in topical dosage form and the agents used to treat malaria are also involved. The treatment of subcutaneous nodules totally depends upon the etiology behind it. The main causes are the infection or inflammation. So, the antibiotics are mostly prescribed along with corticosteroids in topical dosage form. But if the condition become severe, then surgery is recommended. The main medications consisting of antibiotics are prescribed for bacterial infection. Corticosteroid injections are also used for the inflammatory condition. The corticosteroid injection reduces the lump size of subcutaneous nodule. Surgery is performed when medications do not show any effect. In surgery, an incision is made and then that lump is removed aseptically.